Click here to view the current Spiritual Exercise Group topic. Sessions are uploaded to the main website page on Monday. Meetings take place from 6:30 pm to 8:00 pm, the second Monday of each month. Please attend in person, but if you are unable due to location or illness, you can link to the presentation live from the home page of this website. 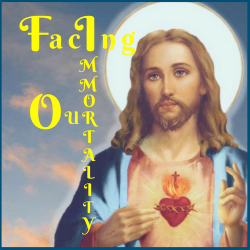 Purpose: Facing Our Immortality is a cancer support group designed for those who are dealing with cancer in their lives, either directly or indirectly. The purpose of the Spiritual Exercise Group is to elevate conversation, understanding and support, to a deeper faith-based perspective where our life-experience, especially at the present time, has God, and His plan/dream for us personally, at the center. This will involve working deeply with the mystery of suffering in our lives. And the Holy Spirit will animate much of this unfolding and direction with each group. We follow the principles of the Catholic Church but are open to anyone who is interested in this unique ministry. This is a place where we can be in communion with Jesus and with one another. The cancer ministry support group takes place in a safe, supportive and confidential atmosphere where people can share their cancer stories and receive spiritual healing. Session Format: We will begin with an opening prayer followed by a Spiritual Exercise developed by Fr. James Flanagan of The Society of Our Lady of the Most Holy Trinity (SOLT). “We humbly approach you O Most Holy Trinity as we beg for your healing. You are Our Father and we trust in your goodness as you draw us daily to become what you call us to be. We humble ourselves before you as we acknowledge your greatness and your infinite mercy. Please dispel within us any form of idolatry, that we may truly worship you with all our being, as Mary our Mother did. Jesus, our eternal shepherd, we come to you like the many sick and the infirm that approached you. We beg you to fill our hearts and our souls with the faith of the Centurion, who only asked you to say but the word, and he knew that his servant would be healed. Or like the woman, we come to touch your garments with great confidence that your healing power will flow through this cloth to the one it is placed upon now. For those of us who struggle with believing in your power to heal, we pray that you help our unbelief.